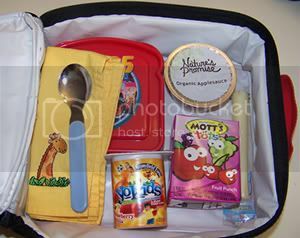 One of my Green Goals for 2009 was to pack waste free lunches for my son. I actually had not realized what a lousy job I was doing of this until I took this photo of his lunchbox for my Fabkins review a few months back. Here I thought I was doing great with the napkin, spoon and reusable sandwich container. But as you can see I also have single-serve yogurt, apple sauce, cheese and juice in there. That's a whole lot of waste going on, especially since our preschool does not recycle (don't get me going...). It is so easy to get into the habit of using single-serve foods. They are so darn convenient - just toss them in and go. We need to take a step back for a moment and think about what happens to these containers when we're done. If the school or place they are being used has recycling, well then it isn't quite as bad. But it is still unnecessary waste. The key is to reduce our waste, even recycling waste. So how do we get away from the single-serve addiction? I started with the applesauce. I finished up the few I had left and then when the grocery store was having a sale on organic applesauce in big jars, I stocked up. Buying a large jar is cheaper then buying single-serve normally, so on sale its even better. I fill a Take & Toss snack cup with applesauce, snap the lid on and voila! No ideally it would be better to get away from plastic and use stainless steel storage, but baby steps. Over time I would definitely like to do that, I'm just not there yet. Do you have any tips for packing a waste-free lunch? Please share them! Here is a green post I wrote which included waste-free lunches (http://blog.lifeinthecarpoollane.com/2009/04/scooters-styrofoam-and-no-waste.html) about half-way down the post. And if you were impressed with my aluminum bottle collection and want to start your very own, here (http://media.oprah.com/sterm/sigg-coupon.pdf) is a coupon for 20% off Sigg bottles. I haven't started packing lunches yet, but I'm getting everything ready for when my son starts school this year. I've picked up some reusable snack bags, but will have to get the other things in the next few months. I use the laptop lunch bento box in a neoprene lunch bag (I forget who makes them - I'm having a Mommy moment). The bento box is great b/c it has 4 containers to put things in and even a smaller tiny one with a lid for letchup or whatever. One of the larger containers has a lid too, so you could put applesauce in it. It is made of plastic but not the slimy kind. It also comes with a real fork and spoon which my daughter loves. Ok, I don't sell them or anything, I just think it is a great invention in the quest for waste free lunches. Yes, William received a LapTop Lunch kit for his birthday. I just haven't used it yet because I fear he is too young and will lose pieces.